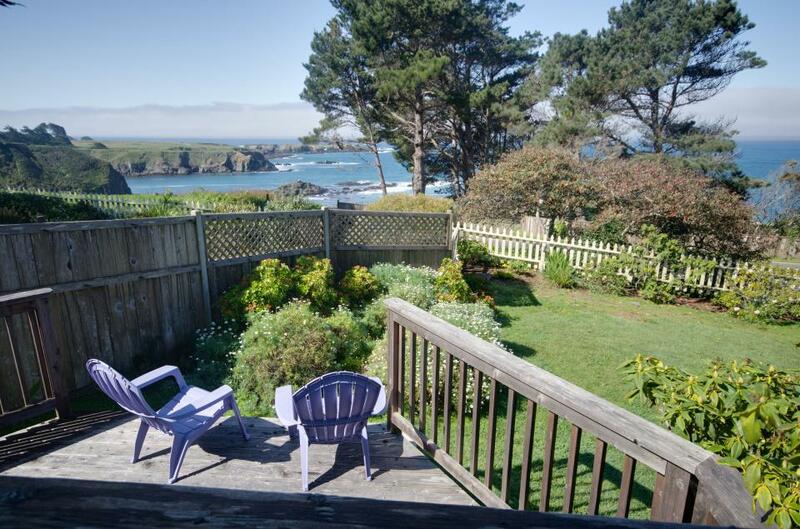 Headlands Cove is a 3 bedroom/2 bath home located at the north end of the Mendocino Village. It sits high on the bluff for blue and white water views of Agate Cove, the Headlands, urchin divers in the cove and hovering Ospreys in summer. Varieties of rhododendrons and coastal flowers, especially Matilija poppies with their paper-white flowers and butter-yellow centers, surround the residence. Decks on the front, side and rear offer opportunities for outdoor cooking and eating as well as relaxing and enjoying the views. The home's interior combines redwood paneling and pastel colors with a gas-log fireplace (thermostatically controlled) and large windows to take advantage of the expansive ocean views and natural light. Leather furnishings and art work emphasize comfort in the living space. Two queen bedrooms are located at the east end of the house with a bathroom in-between. The bathroom includes two vessel sinks and a multi-head shower with steam feature. The living room, dining area, and fully equipped kitchen separates the spacious master suite from the rest of the house. The master suite includes a queen bed, a sitting area with two leather chairs and table, its own bath with jacuzzi & shower and a separate front deck entry. The Murphy-style beds in both the small bedroom and master suite are a unique feature . Easy to use, they provide the option of putting the beds away during the day. This is a wonderful home for a quiet getaway minutes away from the heart of the Village or the North Coast areas of Jug Handle Beach, Fort Bragg and points North.